An unusually early heatwave brought record-breaking temperatures to the southwestern United States over the first weekend of May in 2018. The temperature in Phoenix reached a record-breaking 106˚ on May 6. High temperatures are typical before the Southwest monsoon season. However, the record-breaking nature of recent heat waves is a classic signal of climate change on a warming planet. This is the third year in a row of record-breaking extreme heat in the Southwest during the pre-monsoon season. The early arrival of summer heat during spring is another signature of climate change known as season creep. The climate change signal is especially clear in the southwestern United States where the fingerprint of anthropogenic warming has been formally identified. Heat waves have become generally more frequent across the US in recent decades, and four out of five record-hot days globally are now amplified by the trend in global warming. The fingerprint of anthropogenic warming has been formally identified in heat extremes over the western U.S. In the US, western regions set the most records for the number of heat wave events in the 2000s. 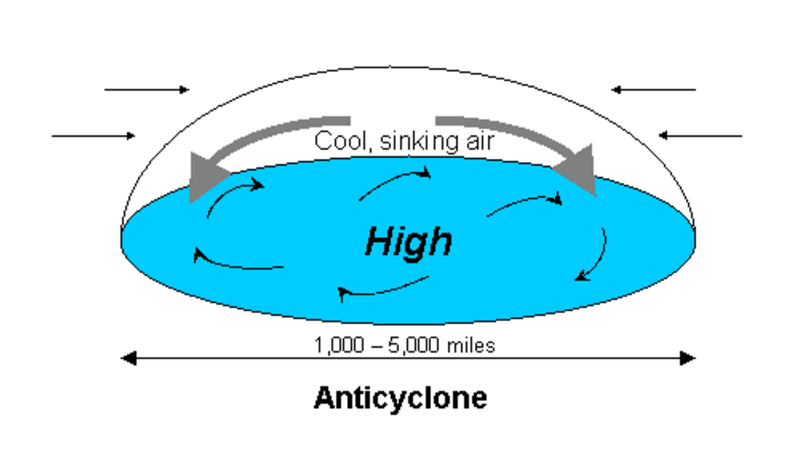 When a high pressure system develops in the upper atmosphere, the air below it sinks and compresses because there is more weight on top. This causes temperatures in the lower atmosphere to heat up. High pressure also pushes the jet stream and its drier, cooler air, farther north. Record breaking temperatures are a classic signal of climate change. As the average global temperature rises and the climate shifts, hot temperatures that were extreme under the old climate are closer to the middle of the new temperature range. Under the earth's climate system, events closer to the midpoint of the climate range occur much more frequently than events closer to the extremes, as shown in the graphic on the right. The shifting bell curve also leads to the occurrence of never-before-seen extremes in high temperatures. The highest temperatures of the year in the Southwest typically occur in late June and early July, before the arrival of the summer monsoon. In 2017, mid-June temperatures soared 15 to 30°F above average setting record. In June 2016, the southwest had two record breaking extreme heat events. Back-to-back-to-back annual record heat events is consistent with the global trend: increasing frequency of extreme and record breaking heat events. The fingerprint of anthropogenic climate change has been identified in the temperature pattern favoring planetary wave stalling. Planetary waves are a pattern of winds, of which the jet stream is a part, that encircle the northern hemisphere in lines that undulate from the tropics to the poles. Normally, the whole wave moves eastwards but, under certain temperature conditions, the wave can halt its movement. This leaves whole regions under the same weather for extended periods, which can turn hot spells into heatwaves and wet weather into floods.